At ICE, we talk a lot about pieces of music. Pieces are the building blocks of our events. They define the story that is told through our concert season. But looking deeper, a piece of music is also a hub of communication. It’s a sonic expression of a composer’s vision. It’s an act of translation on the part of the ICE musicians. And it’s an art of interpretation and discovery for our audience members. Creating new pieces and new interpretations is central to our day-to-day activity. It’s the reason that we do what we do. Recently, we have begun to consider the entire life of a piece from a holistic point of view. Is a piece of music only its performance on stage? We think not. The reality is that most people don’t experience these new pieces in live performance. The majority of new music experiences happen via reading, viewing photos, watching videos, or listening to recordings online. While a premiere of a new work may have 40 people in its audience, thousands of people experience the piece online in faraway places. We often “measure” music by metrics related to its immediacy: seating attendance, video views, record sales.The larger impact to the community comes from the small ripple effects of the other components of a piece’s life: the sketches leading to a new composition, the email threads between composer and performer, the rehearsal photos spread via social media, and the relationships built in the process. After the premiere, a piece has a legacy of transformation. It becomes a palimpsest as rehearsal notes and marginalia are added, erased, and scribbled on the printed sheet music. Second performances, studio recordings, critical reviews, anniversary concerts, and musicological study also contribute to the life of a piece. Over the past five years, ICE has built a number of initiatives to make visible these larger aspects of the piece's life cycle, in the hope of enriching the audience experience and deepening a listener's investment in the new music community. One of the most important parts of the life cycle is ICE’s process of discovery. In the past, composers sent large packages of beautiful scores to our ICEhaus rehearsal space in Sunset Park, Brooklyn. Our paper library of scores by composers from all over the globe occupies dozens of shelves. More recently, composers have sent these scores via email in PDF form. We welcomed this change with open arms, and it led to the creation of ICEcommons. The ICEcommons.org library is a hybrid of a traditional call-for-scores and a crowdsourced reference system of new works. Composers are encouraged to add information regarding their works list to ICEcommons. When ICE (and any other ensemble or performance org) wants to find a new work with a non-traditional instrumentation, we look to ICEcommons first. As we get to know the piece, we use our LUIGI musical database software to catalog information about the work: rehearsal schedules, personnel lists, performance dates, and all of the minutiae related to the performance of a new work. Finally, our live performance videos are collected and distributed on our free library: Digitice.org. Pieces come into ICE’s ecosystem via ICEcommons and they are delivered to the world via Digitice.org. These libraries allow us to bring new audiences to this music and advocate for emerging and underrepresented composers. Our hope is that this three-phase summary of the life of a piece - DISCOVER, COLLECT, ADVOCATE - can become a consistent and holistic part of our daily practice, and we can use these new tools to make a piece available to the widest possible global audience. As an example, let’s look to the piece of music ICE created with Ashley Fure from early 2015 until Summer of 2016 in Darmstadt for its premiere. 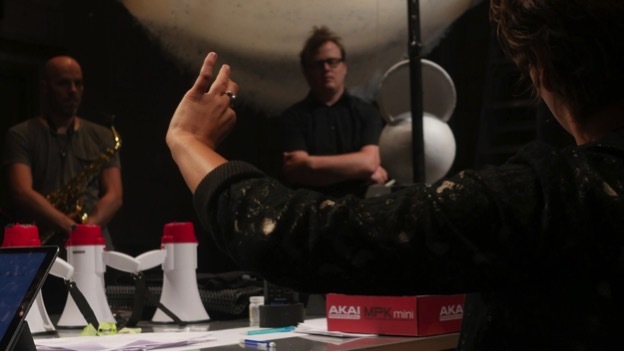 The work, The Force of Things, was a collaborative, intermedia hybrid from the get-go. From the initial meetings and development rehearsals of the piece, we committed to capturing the process in video, still, and written form. The piece developed in several places and times throughout the season. The University of Michigan Liberty Annex at the Taubman School of Architecture played host to the material tests for this object opera while Miller Theatre at Columbia University presented a premiere of a segment of the work. Abrons Arts Center was a second home for the piece’s continuation as we prepared to present a second excerpt at Roulette Intermedium in Brooklyn. Finally, at the official premiere in Darmstadt, Germany, we continued revising the work until the downbeat. The process of creation was meticulously documented and layered in a beautiful trailer created by the Digitice.org media team (Ross Karre, Merve Kayan, Monica Duncan, Bradley Rosen, and Caley Monahon-Ward). The Force of Things’s life enters new stages with upcoming presentations at the University of Michigan, PEAK Performances in Montclair New Jersey, and additional possibilities around the world. 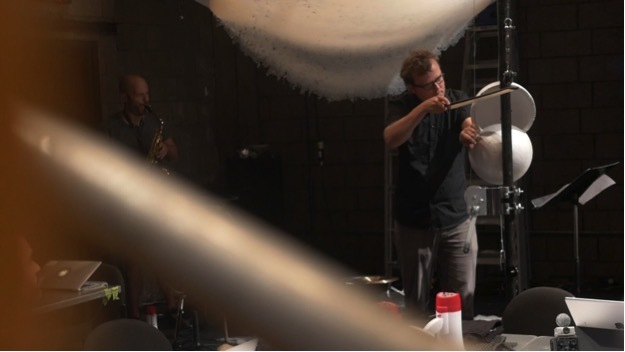 The Force of Things also has led to three smaller works which will have their own lives: Shiver Lung for seven players, Etudes from the Anthropocene for septet and large silicone structure, and Shiver Lung 2 for percussion and electronics. The origin of the idea, which started as a conversation in a bar in Darmstadt 2014 between Ashley Fure and Ryan Muncy, became its own world of creation, spawning new projects with a linked consciousness; and every detail of the work's gestation became an essential element in its forward motion. ICE believes that its documentation of this process is inextricable from the way The Force of Things took shape. Photo: Ross Karre testing the new monocord system with custom styrofoam bridges. ICEcommons has also spurred the lives of several pieces which are new to ICE but were created by other composer-performer pairings. Monte Weber, Mauricio Pauly, Seth Cluett, Ann Cleare, David Coll, Camila Agosto, and many more have had their works discovered via their contributions to ICEcommons. Each will have outlets on Digitice.org, social media, photos, text, and audience conversations at concert after-parties and open rehearsals. Photo: ICEcommons selection Objects in Stillness by Seth Cluett. Abrons Arts Center Playhouse. Also viewable on Digitice.org. ICE makes the communal nature of musical creation into a public endeavor--connecting performers, composers, and audiences via open libraries and forums. We know that a piece isn't confined to its rehearsals and performances; it needs and deserves more. And the musical community thrives when we communicate creatively across many platforms. Stay tuned to iceorg.org as we continue to DISCOVER, COLLECT, and ADVOCATE.